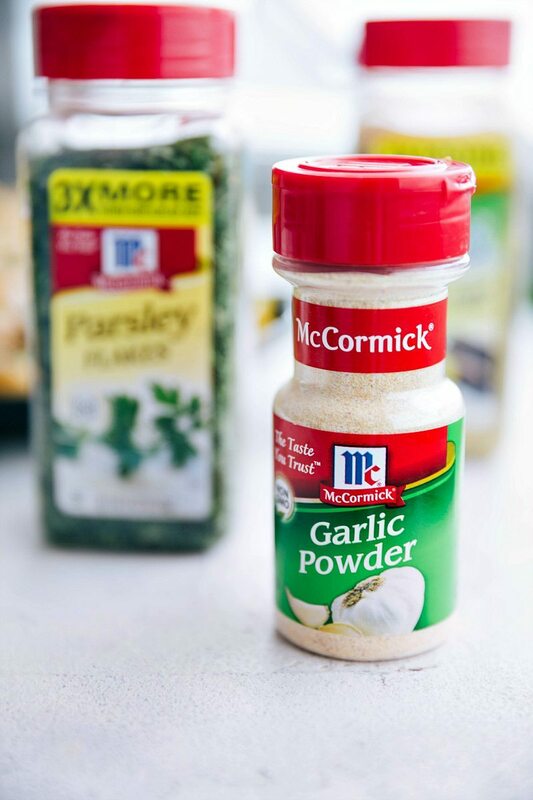 This post is brought to you in partnership with McCormick. As always, all opinions are my own. In our home we frequently do “Meatless Monday” (our favorite meatless meal here) and “Taco Tuesdays.” They’re easy to plan meals for and it’s fun to have some consistency (even if the meatless meals are always changing and sometimes the tacos end up being leftover filling from a Meatless Mondays). So this year I thought it would be fun to add in “Fish Fridays” to the mix! 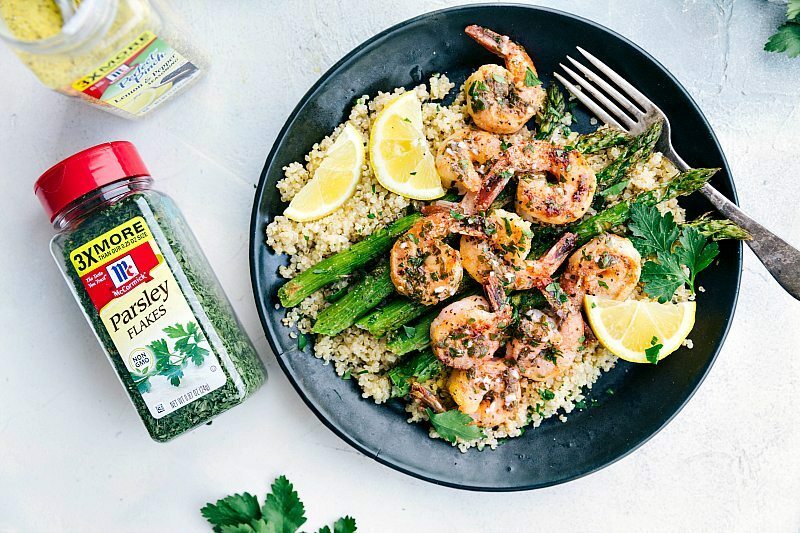 Today I’m sharing a delicious herbed lemon garlic shrimp for “Fish Fridays” and I’m teaming up with McCormick to make sure it is packed with tons of flavor. After trying this simple recipe, I’m pretty sure you’ll want to add “Fish Fridays” to the weekly meal planning! 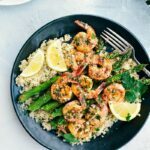 How do you make herbed lemon garlic shrimp? You’ll start by making the flavored butter mixture which you’ll use to near the end of cook time for the shrimp. The butter mixture is softened butter, minced garlic, fresh lemon juice, and fresh parsley leaves. Next, you’ll toss the shrimp in some delicious McCormick seasonings: McCormick Perfect Pinch Lemon Herb Seasoning, Garlic Powder, and Parsley Flakes. You’ll also add some McCormick cracked pepper and fine sea salt. Once the shrimp is coated in the delicious herbs, it’s ready to cook in a skillet. You’ll want to add half the shrimp at first so it can all be in a single layer. If you the shrimp are too crowded in the pan, they won’t cook up as well. And after both batches of shrimp are cooked, you’ll toss it with that delicious flavored butter mixture, let the shrimp stand for a minute, and you’re ready to eat. 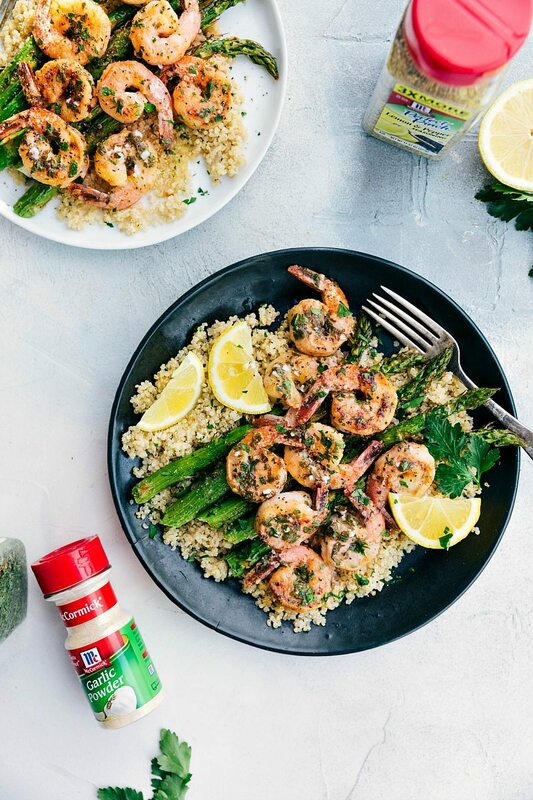 This herbed lemon garlic shrimp is one of the easiest dishes you’ll ever make! 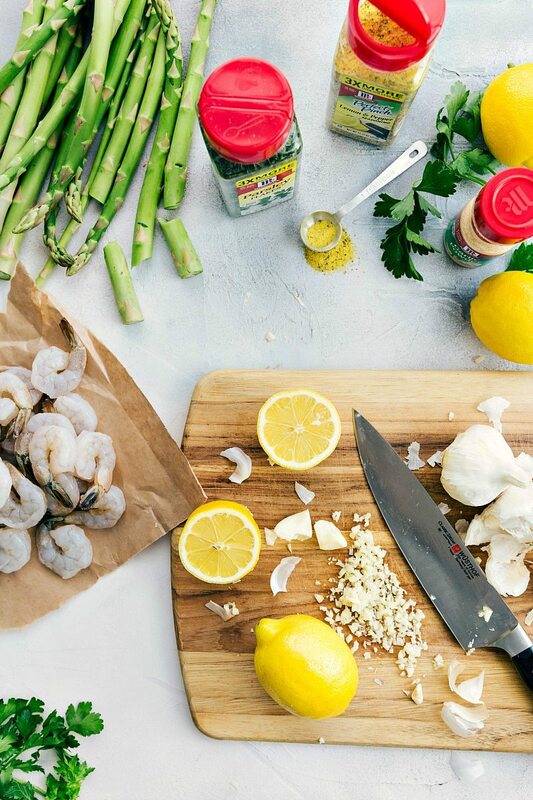 How do you make a lemon garlic butter sauce for the shrimp? The lemon garlic butter sauce for this dish is very simple. It’s only a four ingredients: softened butter, minced garlic, fresh lemon juice, and fresh parsley leaves. You’ll mix the ingredients together and toss the herbed shrimp into this butter right before eating! What do I pair with this herbed lemon garlic shrimp? Since the shrimp is so simple to prepare, you’ll want to keep the sides easy as well! 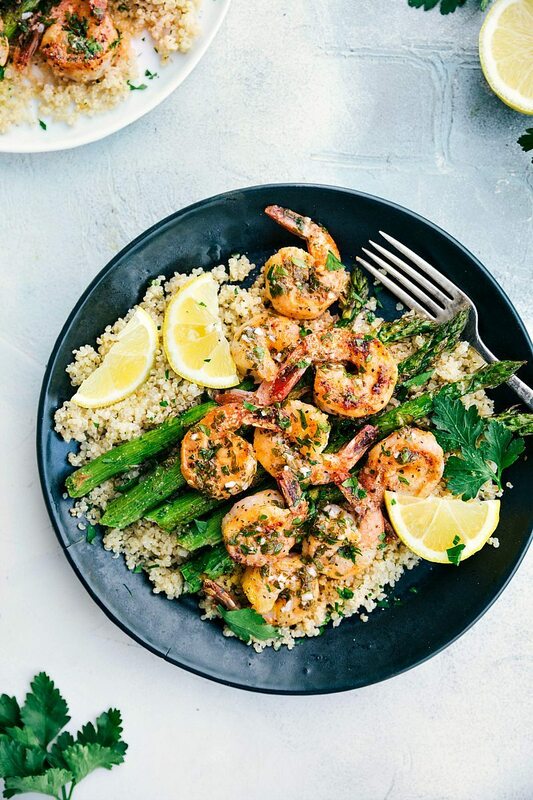 Our favorite way to enjoy this shrimp is listed in the recipe below: quinoa and roasted asparagus. Other ideas: a green salad, a simple pasta tossed with butter, chopped parsley, and grated Parmesan, a mix of your favorite roasted veggies, sautéed kale or chard, creamy polenta, or a side or roasted garlic couscous. Start with the quinoa. Heat the oil in a large nonstick pot over medium high heat. Add in the garlic and saute for 30 seconds, stirring constantly to prevent burning. Add the uncooked (dry) quinoa. Sprinkle with salt and pepper to taste. Saute for another 1 minute without liquid. Add in the broth, bring to a boil, cover, reduce the heat to low and cook for 15-20 minutes. Remove from the heat, fluff with a fork and toss with fresh chopped parsley. While the quinoa is simmering, work on the roasted asparagus: Preheat the oven to 425 degrees F. Break the woody ends off of the asparagus and place on a large nonstick sheet-pan. Drizzle with olive oil, salt (I use about 1 teaspoon), pepper (I use about 1/2 teaspoon, but add s&p to taste), and garlic powder. Toss on the tray and then arrange into a single layer. Bake in preheated oven until just tender, 12 to 15 minutes depending on thickness. Drizzle with lemon juice just before serving. Prepare the flavored butter mixture: In a small bowl, combine the very soft butter, minced garlic, fresh lemon juice, and fresh parsley leaves. Stir and set aside. Heat 1 tablespoon oil in 12-inch skillet over high heat until the oil is shimmering. Meanwhile, toss shrimp, salt (I add about 1/4 teaspoon, add to preference), lemon herb seasoning, garlic powder, and parsley flakes in a medium bowl. Add half of shrimp to pan in single layer and cook until spotty brown and edges turn light pink, about 1-3 minutes (longer depending on size of shrimp). Remove pan from heat. Using tongs, flip each shrimp and let stand until all but very center is opaque (about 30 seconds). Transfer shrimp to large plate. Repeat with remaining tablespoon oil and shrimp. After the second batch of shrimp has stood off heat, return first batch to skillet along with the flavored butter mixture and toss to combine. Cover skillet and let stand until shrimp are cooked through, about 1 more minute. Serve with lemon wedges and fresh parsley as desired. That looks so delicious, I am going to have to make a trip to the store just to make sure I have all the ingredients to make this for supper tonight. I have seen a lot of recipes call for Quinoa, but was never sure how to prepare it, thanks for the directions!! Both my husband and I went nuts over this recipe!! My only critique is that this portion wasn’t enough for the two of us. I’m planning on making it again next week! So glad it was a hit! 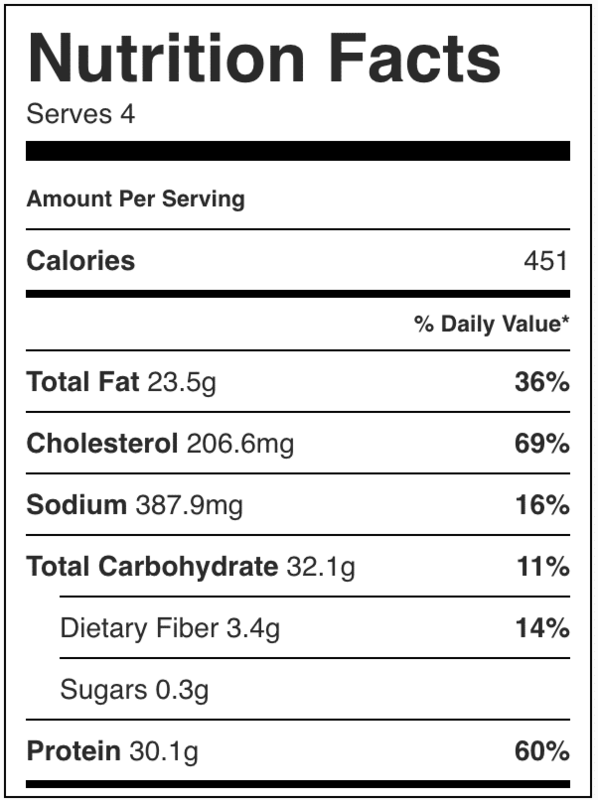 🙂 And thank you for the feedback on the serving size! The recipe and video on FB shows honey. This recipe doesn’t. This was very tasty! My 12 yr old son commented how much he enjoyed this meal. The flavors are excellent! Super delicious! thanks! This was the bomb! 💥It’s incredibly tasty 😋 I added this to our family meal rotation! Thank you so much!